One of my hobbies is stamp collecting. You may enjoy perusing two virtual stamp collections I've placed online. My cryptozoology and philately pages display stamps depicting "cryptids," creatures whose existence is not yet proved such as Bigfoot; creatures which were once legendary but have been shown to exist such as the Okapi and the Mountain Gorilla; and creatures presumed extinct but which may not be, such as the Tasmanian Tiger. My meteorite stamps and coins page displays stamps bearing images of these visitors from outer space. The page also shows classical coins which depict some sacred stones which were probably meteorites. Artist Charles Spencelay painted the "The Stamp Collector" which appears at the top of this page. 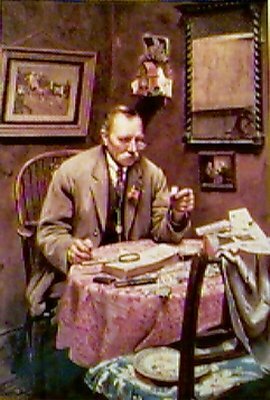 This painting adorned the cover of the American Philatelist magazine in October 1995. I am a member of the Philatelic Webmasters Organization. The PWO seeks to promote, support and develop philately through philatelic webmastering. Please visit their site for links to other interesting online stamp collections. Last modified by pib on July 17, 2003.